Join the discussion on our forums! Come discuss Shallow Gravedigger over in our dedicated Shallow Gravedigger discussion topic. Deathrattle: Add a random Deathrattle minion to your hand. It's hard to put them six feet under when you're three feet tall. Thanks I needed a cupboard. When she dies, she often digs her self again! They might as well have made this a Priest card. They are the only ones that MIGHT use it... Quest Priest plus health buffs. Meh. With the leak and reveal of Ticking Abomination, we now have to wait and see instead of saying she's gonna be OP (which i did). This seems really slow and weak. It might see play in quest priest. unless there are some crazy deathrattle synergies still to come. It's a apresentation card, 3/1 is a really bad stats for a three drop. For Arena... It's Below average card, Really bad stats but a value generator. In stats is similar to Eggnapper, but with a Ping you can remove Shallow Gravedigger. With EggNapper, you still have 2 1/1 in your board. 3 mana 1 health minions require something to keep them on the board. Scarlet Crusader and Eggnapper are being used in both constructed and arena because of this. This card could only be a little bit useful in arena for card generation but it is still bad. Now, I ain't sayin' she's a gravedigger, but she ain't dealing with no net-decker. We have to keep in mind that this is a neutral card with such a great effect. 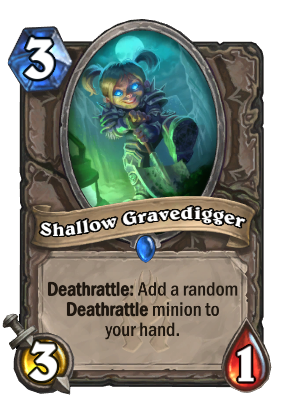 This card will probably be in a lot of decks since this expansion is probably going to have A LOT of good deathrattle minions. It's an aggro card that could give you an unplayable card for your theme deck. Deathrattles are more tempo play anyway, would only see play in zoolock.